I'm back in Newcastle. We reached yesterday afternoon.....decided to take naps at around 4:30 pm..... slept like logs.... and we woke up the next morning! 6 flights in 3 weeks.... phew... no more! 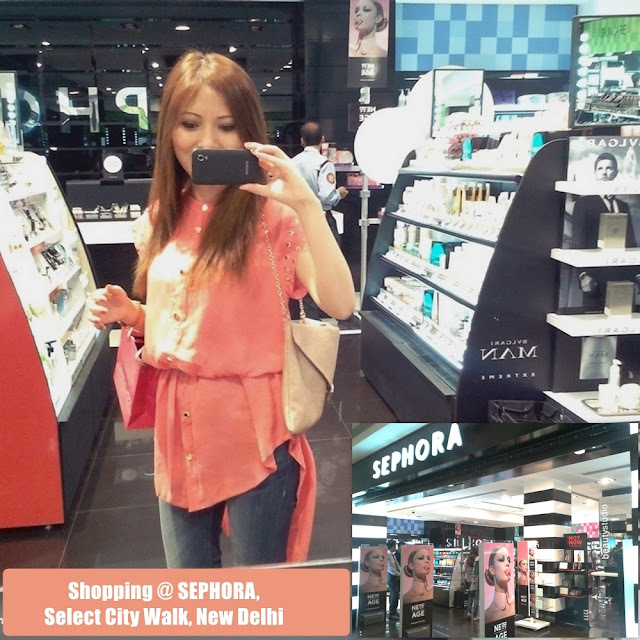 This quick Sephora trip happened in the 1st week in New Delhi, before a family dinner at Punjab Grill (it has the best lamb chops!) I didn't really want to buy anything, coz most of the stuff I would have wanted- Benefit, Soap & Glory - were cheaper in UK. NYX products are also cheaper from Ebay. 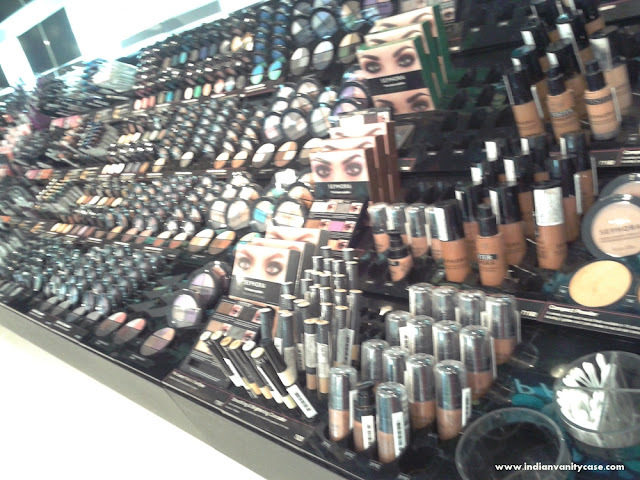 Sephora Makeup ~ Sorry for the blurry mobile pic. 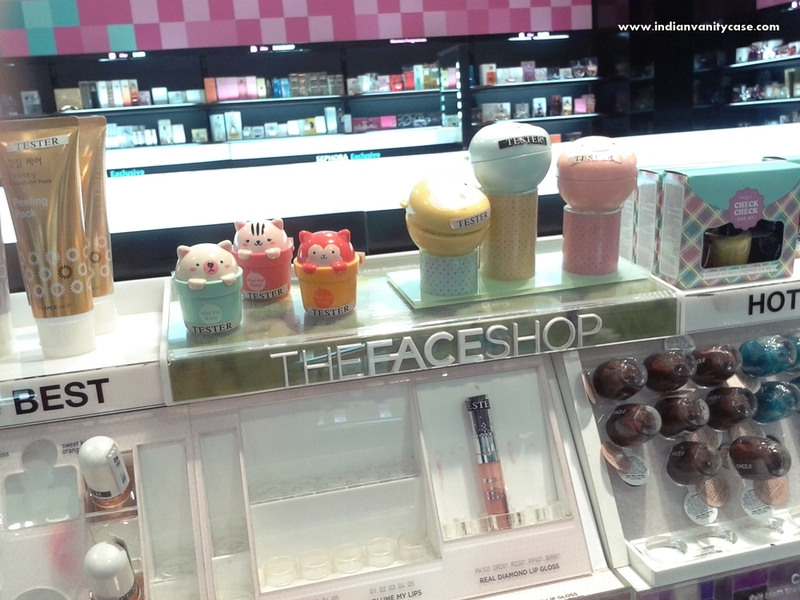 The only things that interested me were The Face Shop products. 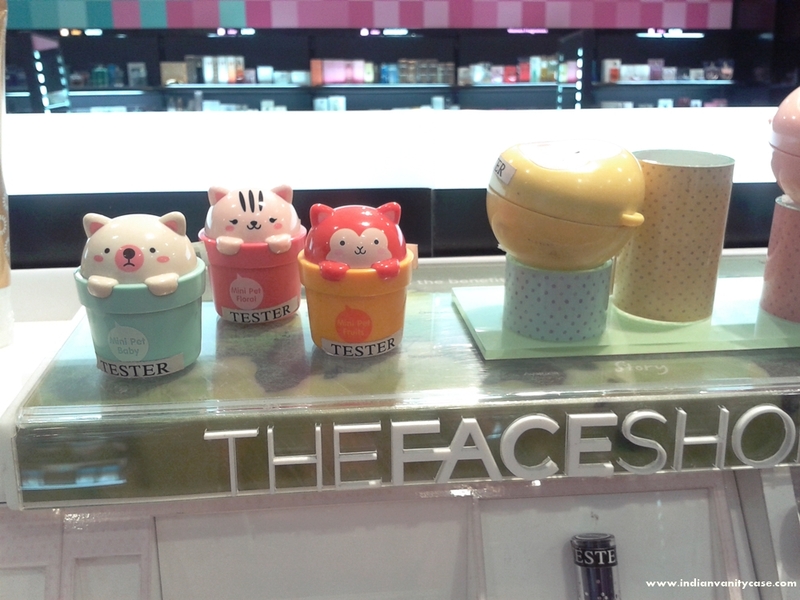 There weren't many products, but the cuties I've had my eye on were there! You remember the little pet hand creams I showed here? Ya, they were waiting for me, and they had friends- some some pet-like face masks. The Face Shop Lovely Me Ex Face Masks ~ Rs.700, I think. The yellow one is a clay mask for oily skin, but I liked blue & peach. I didn't really know what they're for & SA also didn't know. I decided to check them out online, and maybe order them from Ebay. I just bought the Mini Pet Hand Cream Floral (middle). Will post pics and review of it next. 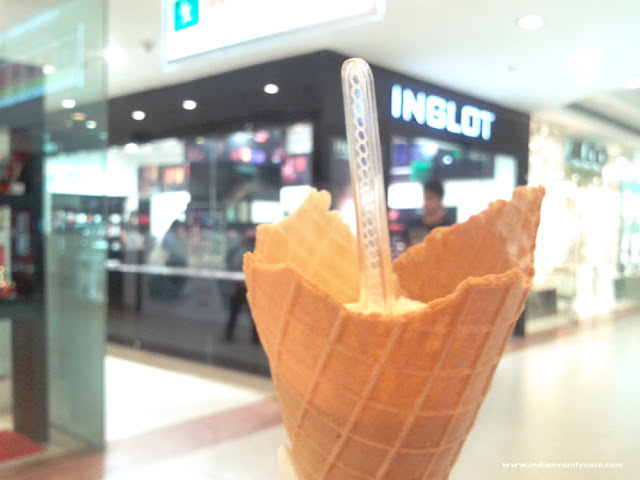 Vanilla Gelato & Inglot ~ I couldn't really check out Inglot that day. I just saw 1 eye shadow that I'd definitely add in my new 10 eye shadow palette. Now that's a different story. Nice outfit.... always love your posts!! i wanted to know if you've tried the Etude House Sweet Recipe collection? thanks for the blog posts, bye !! U luk sweet! 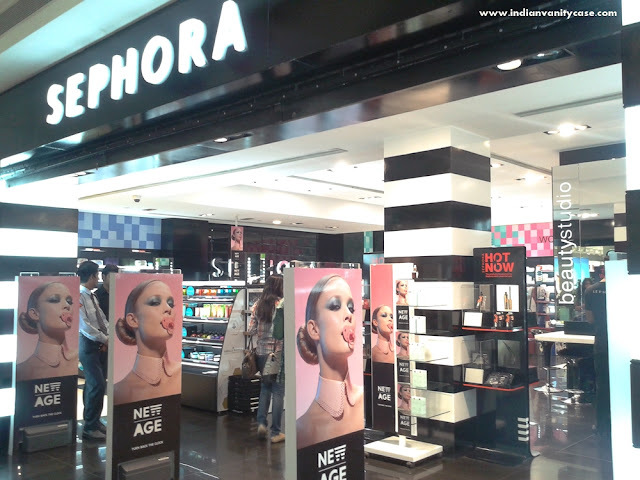 I need a Sephora in Bangalore so badly! I did not know there was a Sephora in New Delhi! I wil have to check it out next time I pop over to Delhi. I just recently bought a lot of stuff from Sephora USA. Have posted about it on my blog. Hi CZ..! need to know really bad.. how could I get one of those 5 set miniature fragrance perfume sets here in Delhi.. I searched and searched in shops and I searched n searched online but no Indian site is selling this cute bottles. 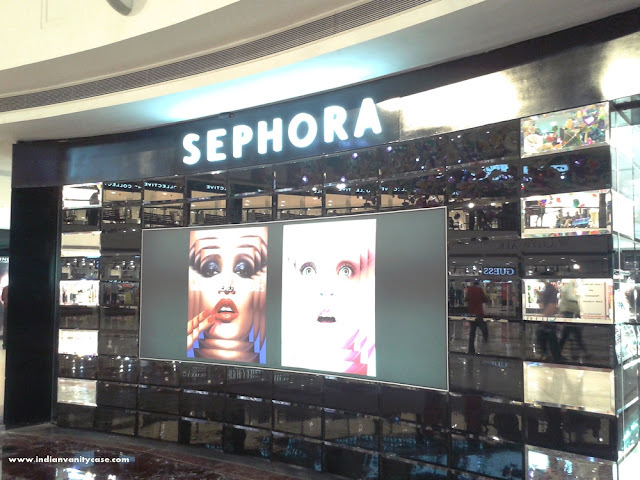 I searched in Sephora as well but they don't ship in India it seems..